Front and back of jewelry charm shown; Charm Size: 1" by 3/4". What says "love" better than a heart with wings, except of course when it's adorned by a regal crown. 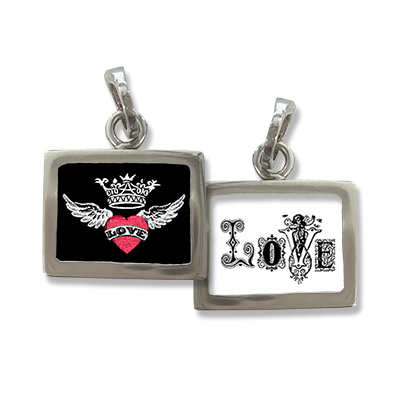 In case there's a question, the reverse side of this charm spells out "LOVE" in embellished baroque-style letters. Either our Princess Crown or Twinkle Arrow are a great complement to this fun statement piece. The quality of product by Pick Up Sticks is incomparable. The designs are delightful and perfection. I cannot recommend enough a purchase of this type charm from any other company but Pick Up Sticks I have experienced the service to be excellent and delivery is quick. It is apparent the owners strive for customer satisfaction in every area.